On our Battles of 1917-1918 tour we discover some of the sites important to the last two years of the war, and those often overshadowed by earlier battles of the war. On our tour we visit memorials to the new allies in the war, the Americans, and also the areas of the front lines where British forces became the dominant power. The battlefields during the latter years of the war show major advances in tactics and technology such as the first mass tank attack at Cambrai. However, a return to more old fashioned technology was needed to support the new and changing face of warfare. On our battles of 1917-18 tour and our Ypres Walking Tour we take the opportunity to visit Kemmel Hill, often also referred to as Mount Kemmel. In an otherwise flat landscape, this hill was a major vantage point from which to observe the enemy. The hill had been behind the British front lines until the German Spring Offensive in this area in April 1918, codenamed ‘Georgette’. This offensive, part of the last major German offensive of the war, punched a hole through the front lines south of Kemmel, and British forces were redeployed from Kemmel to hold the line to the south. French troops took over the defence of the hill but it was lost during a further German attack which was trying to capture Ypres. It was during the German attacks in the Kemmel area that a mostly forgotten force became highly prized by those who worked alongside them, the British Messenger Dog Service. This service was officially started in the summer of 1917 and trained dogs in England to return from the front lines with important messages when other forms of communications had failed. It wasn’t until April 1918 that these dogs were in sufficient numbers on the Western Front that they could make a difference. Many of the handlers who worked devotedly with their dogs found it extremely difficult to work with the infantry, either because of the indifference of commanding officers towards the use of these trained dogs or due to troops feeding and petting the dog when it was in the front lines waiting to take a message back. At Kemmel during the German Spring Offensives in April 1918 reports came flooding in about how successful the dog service had been in keeping communications going when all other forms of communication had failed. 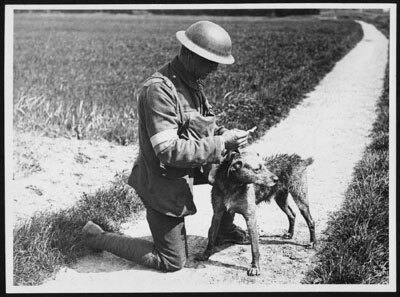 One dog, ‘Dane’, worked tirelessly fetching situation reports every morning for the 10 days he was posted in the Kemmel area. 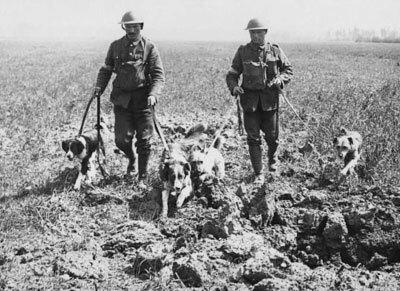 Even after the offensives in April 1918, dogs continued to be used in the sector around Kemmel Hill. Keeper Brown reported of the work of his two dogs Trusty and Peter and how well they had worked in the Kemmel sector in the summer of 1918 bringing messages day and night when they were needed. Unfortunately when Keeper Brown and his dogs were moved to another part of the Ypres sector, both dogs were killed with one shell on 28th September during the major British offensive in that sector. When we visit sites of battles we remember and commemorate the sacrifice that was made by those who fought there, but also remember while walking the battlefields, especially those of 1917-1918 and at Mount Kemmel, the canine companions who also sacrificed their all to aid their comrades.